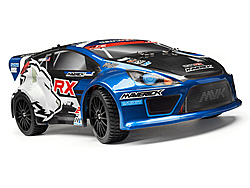 The 1/18th scale range of iON vehicles from Maverick has been expanded with the new iON RX rallycross car. The iON RX shares the same spare parts list as the existing models for easy parts availability, plus the Maverick iON range has been updated with new-spec electronics! The Maverick iON kits lead the way with fantastic brand new top-spec features: a Maverick Element 1200mAh Ni-MH battery, MTX-248 2.GHz radio and a 2-in-1 waterproof MSRS-248 receiver/speed controller. The motor fitted in the Maverick iON RX is the reliable MM-28 370-size motor, so drivers can keep having fun for hours and hours! The 4WD drivetrain uses ball bearings throughout to give drivers maximum runtime and efficiency, and features a molded gear cover to keep dirt and debris away from the gears. Front and rear gear differentials easily transfer the motor's power to durable driveshafts and finally to the grippy rubber wheels at all four corners. The Maverick iON RX features a complete set of gold-colored shock caps for the oil-filled shock absorbers. These add an extra bit of color and style to the chassis, just to make it look that much cooler! The suspension also features dual-wishbone independent suspension front and rear, with reliable C-hub style front hubs and extra-strong single-piece rear hubs. The strong MS-28 servo controls the steering through a dual-point steering system that features and integrated servo saver to protect the servo against crash damage. Finishing off every Maverick iON RX is and fully detailed, completely painted and stickered body with a design that not only looks amazing, it provides additional protection for the chassis components. The iON RX is fitted with an awesome-looking hatchback style rallycross car complete with a racing wing!